Cooking without a Net: G'Day, Mate! When I was rooting around for a pasilla salsa recipe, I discovered a new recipe source. It's called Food Down Under, and they have over 200,000 recipes. I haven't spent a whole lot of time there yet, but they have a lot of recipes from all over the world. I don't remember what key words I used to find the above recipe. I don't know if it looks all that appetizing, but I have to tell you it is delicious. It's a Brown Rice, Lentil and Spinach Curry. 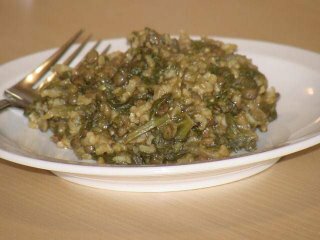 It has a lot of spices that all blend together in the nicest way and the lentils and brown rice go really well together. 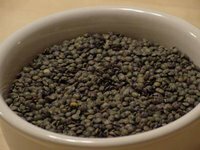 I used the French green lentils I got in Austin over the holidays. Boy, those are good. I didn't realize I could become such a lentil afficionado, but it just goes to show that anything's possible. 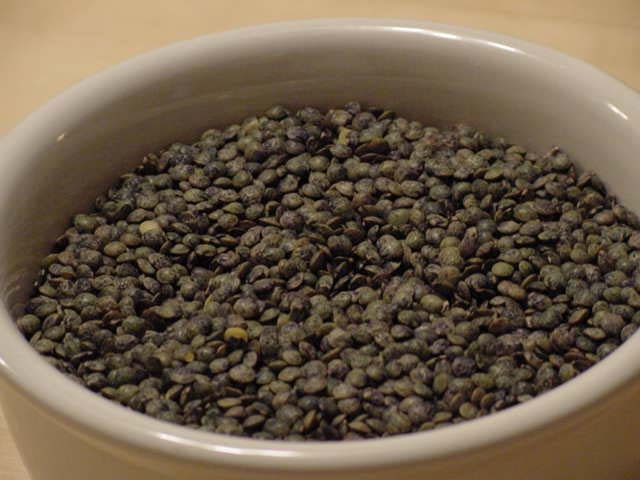 These are similar in consistency to the black lentils, but have more of the shape and size of brown lentils. I'm glad I got so much--I have enough for at least two more dishes. I don't believe I showed you what those look like. I must rectify that at once! I don't know if you can tell from the picture, but they're light green with tiny little specks of dark green. They're a little less flat than their brown counterparts. I wish I had some regular lentils so I could show the contrast. Maybe I'll do that in another post. At any rate, this dish is really good and filling. It makes quite a bit, too--it will last me for the week. I don't know if it would freeze all that well. I might test a portion. I didn't make many changes to the recipe. I forgot my new rule and bought a fresh jalapeno, which once again didn't have any kick to it whatsoever. But I kind of liked it without heat. Instead of using the pickled, hotter ones next time, I think I'll just omit them. The spices are so subtle here that the heat might drown them out entirely. I wasn't completely sure what they mean by saute liquid, so I used a couple of tablespoons of canola oil. I used my pasta pot for this recipe, which has a steam hole on the lid. The rice did not cook in the time suggested and I realized this was probably why. I replaced the lid with a solid one and cooked it another 20 minutes and it came out perfectly. until ready to add to the rice. unabsorbed water in the lentil pot. Add salt, pepper, and broth or water. rice mixture. Cover, reduce heat to very low, and cook 30 minutes. serve. Serves 3 or 4 as a main dish. Note: Edited 02/13/11 with actual source: from Pilaf, Risotto, and Other Ways with Rice, by Sada Fretz (Little, Brown 1995).